Cino Auto Repair is a family owned and operated business that was established in 1984 by husband and wife Alfonso and Lina Cino. 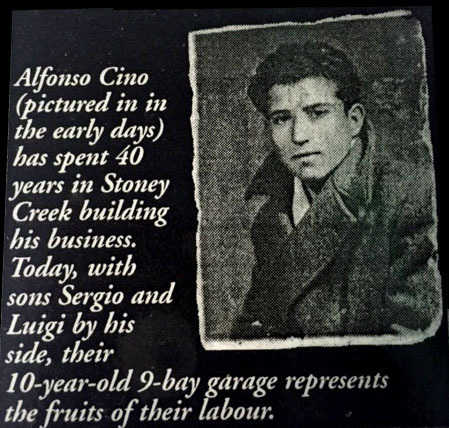 Alfonso trained as a mechanic apprentice during his time with the Navy in Italy and expanded on what he learned when he migrated to Canada in the 1950’s. For 24 years, Alfonso was regarded as the top technician at the Stoney Creek Canadian Tire. Eventually it was time to move on, and start his dream as a self-employed entrepreneur. With a young family both Lina and Alfonso worked many long hours at their new business, and with hard work and determination, they quickly built a reputation of honesty and integrity in the community. The business became very successful very rapidly, and they soon outgrew their 2 bay gas and service station. 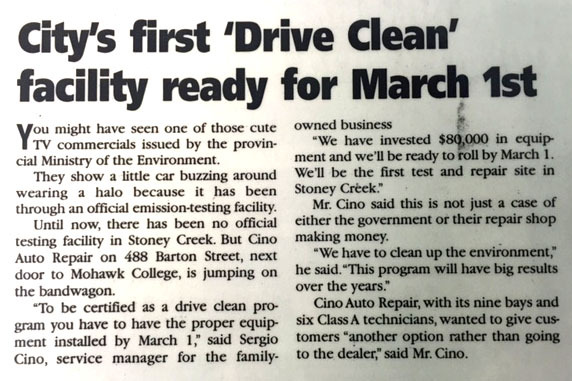 In 1986 the time was right to expand, and they built a new 4 bay service centre where Cino Auto Repair is today. As the years passed and with both sons finishing university, it was time to expand once again. In 1990 Cino Auto Repair expanded to a nine bay service centre with 6 auto technicians. 30 years have passed since Cino’s was established, and brothers Luigi and Sergio Cino have continued the dream that their parents began. Luigi and Sergio pride themselves on maintaining a clean, professional environment, and being respected as the best in the business. Both brothers are university educated and hold “Class A” technician licences as well as Drive Clean certification. Their technical credentials help them understand the products they service and sell. They continuously re-invest in the company with updated technology and employee training. Our employee team is our family and our technicians have exemplified our company values. The Cino family and their employees pride themselves in honesty, integrity and quality. 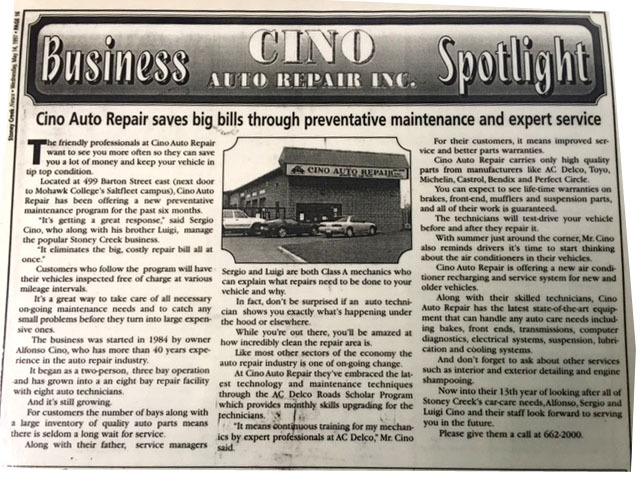 Cino Auto Repair appreciates their customers and friends for helping them achieve years of growth and prosperity and for allowing Cino’s to continue the dream that Alfonso and Lina started over 30 years ago. Cino Auto Repair is known for Quality, Honesty and Integrity. Our business operates out of a state of the art facility that offers complete automotive service for all makes and models of cars. This means our technicians can attend to all of our customer’s vehicle needs, without the need to visit different facilities to have them done. We are a one stop shop. Customers can also bring a new vehicle to Cino Auto Repair for maintenance without affecting its warranty. Cino Auto Repair’s computer system can track each customer’s maintenance service and help keep them on schedule with reminder cards sent in the mail or by email. Cino Auto Repair also corresponds with customers through promotion and thank you cards. Recently, we have partnered with Napa, which has allowed us to offer outstanding national brand name products and exceptional quality services, at the right time and at the right price. The Napa Autopro program offers quality assurance protection, which includes a minimum of 1 year 20,000km warranty on parts and labour. Cino Auto Repair also has retail distribution of Cooper, Hankook, Khumho, Bridgetone, Firestone, Michelin and other national namebrand tires. A dependable tire line that meets the needs of consumers, from everyday motorists to high performance off-road enthusiasts.